Geoffrey "Geoff" Downes (born 25 August 1952) is an English rock songwriter, record producer, and musician, mainly a keyboardist. 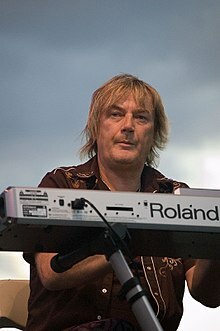 He is mainly known as a member of the New wave duo The Buggles, progressive rock band Yes, and supergroup Asia. ↑ 2.0 2.1 2.2 2.3 2.4 "Geoffrey Downes; Discography". Allmusic. Retrieved 16 December 2014.